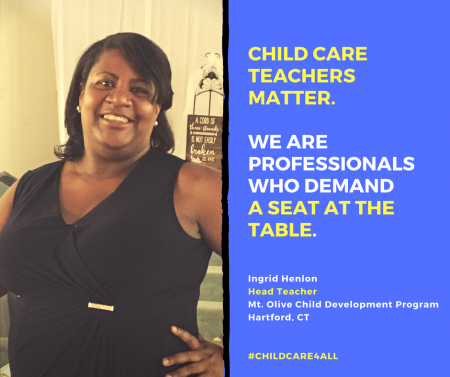 Ingrid Henlon, a head teacher at Mount Olive Child Development Program in Hartford, Connecticut, spoke at the press conference announcing the Child Care for Working Families Act, which represents a gigantic step on that path towards the child care system we children, families, and workers deserve. This bill will raise standards, cap parents’ child expenses at 7% of their income, and improve wages and training opportunities for child care teachers. It lays out a foundation for what a child care bill can and should be. Watch the press conference now! Ingrid comes in around the 31-minute mark. Read more about this legislation in Politico, The Hill, Newsweek, Fast Company, Ebony, Refinery29, and more.